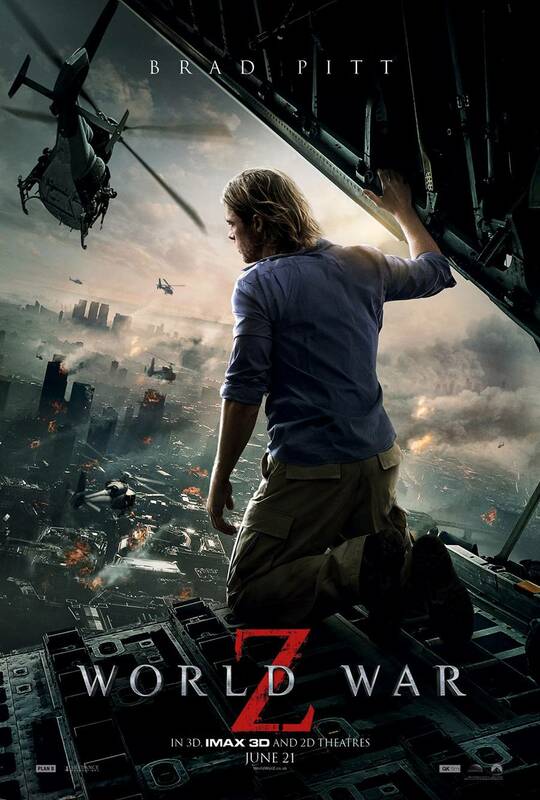 “World War Z” started today, so move over Will Smith. This time Brad Pitt (Moneyball) is taking the lead to save the world. And no, before you ask, he is NOT the last man on Earth. Gerry Lane (Pitt) has moved from elite world problem solver to pancake maker for his wife and family. When some undead people move into the neighborhood he says, “We have to get out of the city.” Somehow he still has a direct line to the Head of the UN, and he gets the last ticket out of “Bites-ville,” New Jersey. The price of that ticket to save his family is finding out how all this started and saving the world. I hear they spent a couple hundred million to make this movie, but that didn’t translate to the screen. I think most of it went into make-up, and for the entire crew to wait two days for Brad to get that perfect beard growth. Then they’d shoot all day and have to wait two days to shoot again. After viewing the trailer, you are prepared to see our hero battle the zombies and save the world. The formula for this was found in a cigar box under Roger Corman’s Cabana; if you add Brad Pitt and zombies, you get a blockbuster. But this is not an epic action movie. Sure, he does do a little hand-to-zombie combat, and you get a good look at the madness. In the end, Gerry must use his mind, his insight and his instincts to solve the problem. This is a small story in the middle of an action adventure zombie movie. It makes for an okay movie, especially for our hero. His character has a nice arc while the rest of the cast doesn’t have much to do. They seem like props and are only slightly more fleshed out than the zombies. I looked at my watch after the first hour, and I thought the movie had been really slow in revealing plot points. The only challenge our hero had dealt with was transportation. He should try to get out of Washington, D.C., on the weekends. With all that, I still give this movie 3 stars out of 5, because it surprised me with the small personal story in the midst of the zombie apocalypse. Gerry turns into the reluctant hero, much like Rick in Casablanca. He wants to protect the people he cares about, and the only way to do that is to make the world a better place. If not better, a little less “bity.” I have to admit, a little Brad Pitt in an apocalypse is a good thing.